In January of 1988, Jerry Brunetti and I founded EarthWorks. For 30 years we have built carbon-based fertility products and helped superintendents use soil testing data to make positive changes to their properties. From the day our company started we have felt a very deep respect for the work done by soil managers. We have always believed that the health of the soil is imperative, and that using fewer inputs helps preserve our natural resources — the soil. It has only been recently that the industry has begun to embrace our beliefs, and today we often hear the phrase “carbon based,” being used, a term that we coined 30 years ago. Feeding carbon to the soil helps to proliferate microbial populations, these microbes can start to digest thatch into humus that builds water-holding capacities and in turn provides bioavailability of nutrients. This point is often missed, and carbon-based fertility then becomes a “feel good” fertilizer used for only the limited nutrients listed on the bag. We are not trying to be another, more environmentally friendly, NPK concept. In fact, the nutrient analysis is only a small part of the value of the approach, because it is microbes digesting and mobilizing minerals and releasing nitrogen, that are responsible for providing most of the food to the plant. The reason we “balance the chemistry and feed the soil” is because soil biology needs the environment provided when a soil is chemically balanced (better air and water movement) and microbes need available forms of carbon (food/energy) to proliferate to create nutrient bioavailability. This is what we mean by having a deeper respect for the soil and, and in turn, the people that work that soil. Plants pull in nutrients in two ways; one is “passive transport” the other is “active transport.” Passive transport or diffusion is where ions move from high concentrations to lower concentration; it is less efficient, and no metabolic energy is used. Passive transport takes place when “soluble” nutrients are flooded into a root zone, which can be very problematic when those nutrients are of a high salt content. The high salt concentrations force the plant to draw in more water than is needed to prevent dehydration. This causes the plant cells to fill with protein and water, the perfect environment for plant disease outbreak. One purpose for a carbon and mineral based soil diet is to allow soil microbes to promote the process of “active transport” of nutrient uptake into the plant. In a strong biological environment, where microbes are fed ample amounts of available carbon and have minerals to digest, dissolved molecules can move across the cell membrane in a much more efficient and plant friendly manner. Active transport does require an input of energy (ATP – biologically mineralized phosphorous), which in a biologically active soil environment can happen freely. In an article written by our colleague, Lawrence Mayhew entitled “Solubility vs. Biology” (available on our website – www.soilfirst.com) he describes bioavailability in this way: “that portion of the substance which is transferred to a living organism as a result of geo-microbiological interactions among living and non-living soil components over time. The bioavailability of plant nutrients is affected by complex symbiotic and non-symbiotic exchanges among microbes, higher plants, rhizosphere interactions, soil particulate matter, organic matter, colloidal clay particles and soil mineral components. The bulk of these interactions take place in the extreme microenvironment of the plant rhizosphere and in biofilms that form on minerals as a result of microbial colonization.” These concepts are what formed the backbone of the carbon and mineral rich products that EarthWorks has been offering clients for 30 years. There is much talk recently in the turf industry about using a minimal amount of nutrients; something EarthWorks has been a strong advocate of since the conception of the company. The issue with the current conversation is that it does not consider bioavailability and how plants take up nutrients. Simply using less salt fertilizer can lead to plant failure because ultimately nutrients will run out and the plant will not be able to take up what it needs. This is particularly true if there is a lack of focus on providing nutrient bioavailability by supporting and feeding microbial populations. Minimum levels of fertility should be a goal of all soils managers, but this cannot be achieved if the soil chemistry and its biological environment are not the focus of the program. It’s the soil microbes that interact with plant roots, soil organic complexes and minerals that release nutrients available to the plant. This was a hard-learned lesson when we started selling fertilizers. I thought, as any young conventionally trained agronomist and upstart businessman would, that more is better. What I found out quickly by listening to our clients was less is more. Superintendents that have subscribed to this philosophy have realized better control of fertility and reported that turf color never just falls off. They were also able to maintain stronger moisture levels in the soil and saw less weed, insect and disease pressure. In 1988 we built our first products, the 5-4-5 granular fertilizer, one of the most popular fertilizers in the industry today, and a liquid soil conditioner called KICK. The 5-4-5 provides a volume of available carbon sources but has a big focus on re-mineralizing our sand rich and mineral deficient soils. The carbon feeds microbial populations but the minerals provide the long-term sustainable nutrients that microbes can make bioavailable over time. The KICK product, as is true of all of our liquid products, provides more quickly available but less sustainable forms of carbon to the root zone. A program that uses both the sustainable granulars and available liquids, provides the best feeding opportunities to both plant and microbe. Recently the entire EarthWorks liquid line has been re-branded with the new name Foliars+. The purpose of this is to emphasize the nutrient dense “foliar” function of the product line, however when as much as 80% of all foliars roll past the low-cut turf blades conventional liquid fertilizers aren’t of much help. The “+” in the Foliars+ line represents all the carbon and minerals in each product. It’s these inputs that allow the soil microbial populations to get involved and generate the bioavailability that our clients have come to rely on. Highly engineered formulations is what makes the Foliars+ line as effective as they are today but it is the humic acid complex, put together by Lawrence Mayhew, that gives these products their power. 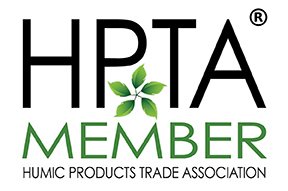 Lawrence was one of the founders of the Humic Products Trade Association (HPTA) an organization dedicated to promoting quality standards and honesty when it comes to claims made about humic acids. EarthWorks is one of the first, and one of only a few companies in the turf and ornamental markets that meets the standards of the HPTA. Understanding the biological aspects of how a soil works and a commitment to quality carbon and mineral based products is how EarthWorks has been helping the turf and ornamental industry since 1988. Our deeper respect for the people who have dedicated their professional lives to building better outdoor spaces for their communities is why we do what we do.